Canadian Brass. By Duke Ellington. Arranged by Luther Henderson and Paul Murtha. Score and full set of parts. 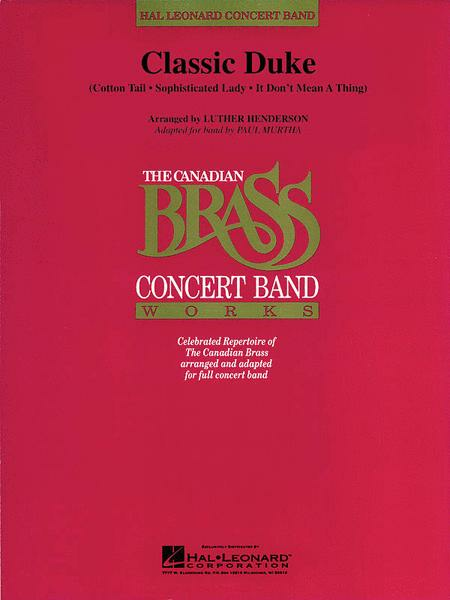 Canadian Brass Concert Band. Concert. Published by Canadian Brass (HL.8724054). 9x12 inches. Arr. Luther Henderson/adpt. Paul Murtha. Originally scored by the legendary Luther Henderson for full orchestra and brass quintet, here is a great-sounding adaptation for concert band by Paul Murtha that features three classic Ellington compositions. Includes: Cotton Tail, Sophisticated Lady and It Don't Mean a Thing (If It Ain't Got That Swing).